These really are a great snack food. How can I tell? When I’m looking at a recipe or a commercial product, I start with the ingredients, NOT the nutrition label. You see, companies can make all sorts of non-real-foods seem good by manipulating them to appear good on the nutrition label. Then, they make all sorts of unsubstantiated nutrition claims about their nutrient-manipulated non-real-foods. What a crock. Instead, simplify. Look for real, whole foods in the recipe or on the ingredient list. If these check out, then move to the label (if you want) to see if they fit into your goals at hand. Looking for carbs before a ride…take a look. Need protein in recovery…check it out. And, for a snack? 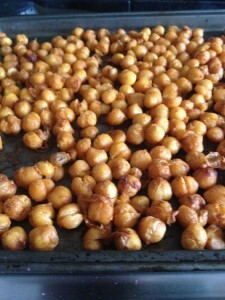 How about a real food like chickpeas and spiceslthat provides carbs, protein, and fiber. Done and done. Nutrients can be important, but ALWAYS start with the ingredients.